^ a b c d e ジョージ・ソロス 大原進訳 (1999-1-18). グローバル資本主義の危機. 日本経済新聞社. 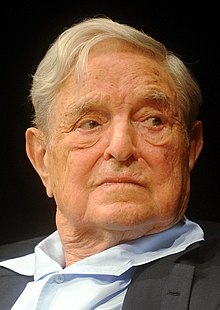 Neil Clark Analysis of Soros' role in Eastern Europe from "New Statesman"
Victor Niederhoffer and Laurel Kenner in the Speculator. George Soros, The Bubble of American Supremacy, editorial in The Korea Herald, March 12, 2003. Bryant, C. G. A. (2002). 'George Soros's theory of reflexivity: a comparison with the theories of Giddens and Beck and a consideration of its practical value', Economy and Society, 31 (1), pp. 112-131. Cross, R. and D. Strachan (1997). 'On George Soros and economic analysis', Kyklos, 50, pp. 561-74.